Where whales and icebergs cross paths! ... when you need to escape a hurried life, Elaine's B&B by the Sea is the place to be. 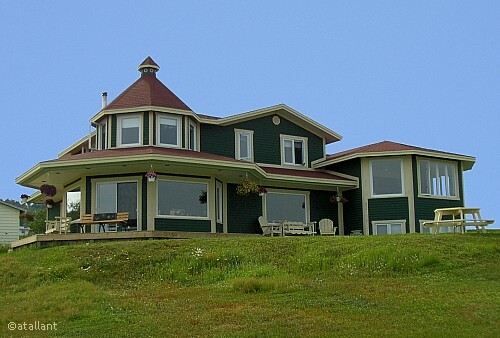 Elaine's B&B by the Sea is nestled on the banks of the Atlantic Ocean and is located on the Avalon Peninsula of Newfoundland 30 minutes from St. John's, the provincial capital. At Elaine’s B&B by the Sea you’ll find an unbeatable combination of superb landscapes, an unhurried pace of life and a unique culture. You’ll enjoy the generous and genuine Newfoundland hospitality of your hosts, Elaine and Danny Dinn, who will welcome you to their charming home with its panoramic view of the Witless Bay Ecological Reserve, which is home to millions of birds including the Atlantic Puffin. In season, watch the whales blowing and breaching from their dining room. Perhaps you’ll be fortunate to see an iceberg as well. They offer zodiac tours out to the sanctuary several times a day, even before breakfast. You can hike the nearby East Coast Trail which offers spectacular scenery as it winds along the shoreline. Lord Baltimore’s 17th century colony in Ferryland is a 35 minute drive from our B&B. The oldest marine fossils in the world at Mistaken Point and the Cape Race lighthouse are an hour away. The Cape St. Mary's Ecological Reserve and the caribou herds are about an hour and a half drive south from Witless Bay. Let your worries wash away as you relax to the sounds of the sea at Elaine’s B&B by the Sea.